Can Facebook Get People Really Excited Over Virtual Reality? Have you heard how hard Facebook has worked to promote its virtual reality Oculus Rift technology? The social media powerhouse set up pop-up stores all around the nation to offer personal VR demonstrations and create consumer demand for its new virtual reality headsets. 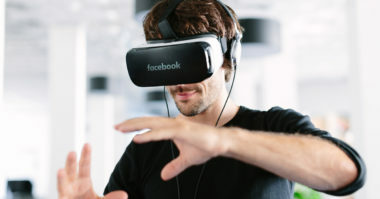 After all, Facebook invested several billion dollars and expects to invest a whopping $3 billion more on Oculus Rift and really needs to see it pay off. That’s why they’ve taken to the streets to literally show consumers that their virtual reality headset provides an experience that can’t be missed. To see whether Facebook’s direct demos added up to consumer interest, Business Insider shared the reality of their promotion to see if it was offering real results. Facebook used its pop-up stores to offer consumers a six-minute demonstration of the Oculus Rift to provide a taste of the technology that consumers may only have ever seen in video games or sci-fi movies, or not at all. Facebook is hoping to show consumers how the technology of tomorrow can become their very own reality today. In the Oculus Rift demonstrations, the participant holds on to a stable chrome bar railing as they are shown a couple of very short scenes of different virtual worlds, right before their eyes. These scenes include asteroids flying around in space, a family in Mongolia, riding around on an elephant, coming face-to-face with a dinosaur, and seeing a boat on a distant island. They were all specially chosen to be visually captivating and give people the impression that they are experiencing these foreign and rare sights in real life. Most importantly, these images were designed to create an irresistible sense of excitement and a huge demand for Oculus Rift. These demos do not include any type of hand controls, so people are only able to look around and watch the three-dimensional scenes. Today, developers tasked with creating the Oculus Rift’s virtual reality content are working on new ways to tell compelling stories through this 3-D technology. For now, Oculus Rift users are limited to simply watching a scene unfold on a screen instead of feeling like an actual part of it. The experience is strikingly similar to watching a 3-D or IMAX movie, yet with the burden of wearing a very large headset. It could surely hold a person’s interest for a while, but the technology may not be advanced enough to convince people to spend hours a day and hundreds of dollars on an Oculus Rift of their own. While it appears that these personal demos are achieving Facebook’s initial goal of encouraging people to try the Oculus Rift, it remains to be seen if a few minutes of demo participation leads to mass market buying. This is due to the fact that an outstanding virtual reality experience is still far from a reality. The idea of consuming entertainment by strapping on the big, bulky headset required for the Oculus Rift technology may not be so attractive to the average consumer. It may very well be that virtual reality should be reserved for video gamers and sci-fi fans until it is more developed. Unfortunately, Facebook can’t afford for Oculus Rift to fail. The social media giant spent billions of dollars to acquire Oculus a few years ago, and then they invested an untold amount to make sure the technology met its specifications and standards. Only time will tell if Oculus Rift will become a part of consumers’ daily reality. Follow what’s new in digital marketing. Contact MDG Advertising.